Learn anatomy from the inside out in this unique Yoga Tune-Up® comprehensive anatomy module designed to expertly guide you into your living tissues in a concrete and inspiring way. The Yoga Tune Up® educational methodology is unique in its fun and accessible approach to the clinical language of anatomy and has proven to drastically improve the student's understanding and retention of the many complex systems of the human body. In this module, through dynamic movement in combination with video, 3-D models, palpation, and massage tools and techniques you will discover: Multiple layers of the body, how they relate and function as a whole, specific anatomical systems and their physiological processes, learn and locate vital structural landmarks, muscles, joints, bones and fascia and their interrelatedness with breath, circulation, and immunity, and typical movements patterns, injuries and pathologies. This comprehensive 16 hr/2.5 day training takes the YTU approach to improve a students’ retention of the clinical language of anatomical structures, physiological processes, movement patterns, and pathologies as they relate to yoga. The curriculum is suitable for all levels and especially for any movement professional who seeks to sharpen knowledge of the meaningful continuities of the body within any yoga or fitness practice. Lillee Chandra LMT, E-RYT is a licensed Massage Therapist, Yoga Tune Up® Integrated Teacher and Anatomy Trainer. Her passion for teaching others to move well is fueled by more than 20 years of experience in competitive sports, movement arts, health education, and bodywork. She is distinguished among alternative therapy practitioners as a specialist in postural education, pain management, and injury rehabilitation. 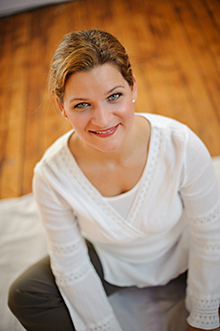 She presents at Kripalu Center for Yoga and Health, Pure Yoga, and YogaWorks. Lillee is currently concluding her Clinical Orthopedic Massage Therapy Certificate with Dr. Joseph Muscolino. For more information about Lillee click here!